Whether you work outdoors or engage with nature for a hobby, these KEEN Utility Men's 1018653 Boulder Mid Magnet/Gargoyle Hiking Boots are an ideal choice for men's footwear. They're durable, comfortable, protective, but most importantly, they're waterproof. Th ... (see full details) (see specifications) #1018653. Whether you work outdoors or engage with nature for a hobby, these KEEN Utility Men's 1018653 Boulder Mid Magnet/Gargoyle Hiking Boots are an ideal choice for men's footwear. They're durable, comfortable, protective, but most importantly, they're waterproof. These men's steel toe boots are built with long-lasting quality. They feature an upper crafted from synthetic material. Synthetic means man-made, and on these oil-resistant utility boots the man-made material is specifically designed to last through hard work and various terrain. The synthetic upper is accompanied by a rugged, non-marking rubber outsole. It's super tough and won't disappoint you in terms of long-lasting quality. Durability is important, but so is comfort, and these men's slip-resistant boots can keep you comforted. They are made with a dual-density compression-molded EVA midsole and a removable, metatomical polyurethane footbed. The midsole offers not one but two layers of lightweight midfoot support beneath the footbed, and the footbed offers cushion that contours to the unique shape of your feet. It also provides excellent arch support. And lastly, the men's waterproof boots are designed with Cleansport NXT technology for natural odor control. They keep the unpleasant smell of sweat away to offer a clean, fresh foot environment. These men's safety toe boots are also waterproof, so they're perfect for outdoor wear. 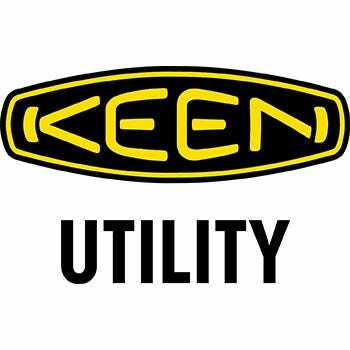 They're crafted with Keen's KEEN.Dry waterproof breathable membrane. It makes sure that air can still reach your feet while wetness cannot. Last but not least, these men's odor control boots can keep you safe from harm. They're built with left and right asymmetrical toes that meet the requirements for the safety standard ASTM F2413-11 I/75 C/75. The toes can prevent harm from drop impact and compression, but they can also provide a better fit and feel than other steel toes due to the unique left and right asymmetrical design. Along similar lines, the aforementioned standard is achieved for electrical hazard protection as well. The rubber outsole found on these synthetic EH boots will prevent electrocution if you encounter an open electrical circuit in dry conditions. Moreover, the outsole is slip- and oil-resistant, too. You'll notice increased traction on these mid work boots in a variety of slick surfaces to prevent unwanted slips and falls. For hiking, working, and more, these KEEN Utility Men's 1018653 Boulder Mid Magnet/Gargoyle Hiking Boots are a great choice. Order them here at Working Person’s Store today! I've never seen a business so "on top of things".... thanks for the quick shipment! I will definitely be a regular customer and I've already passed your link on to my friends. I appreciate that you carry sizes for the larger man... He is truly hard to buy for. KEEN Utility: Men's 1018653 Boulder Mid Magnet/Gargoyle Hiking Boots is being added to your cart.